Well 2015 couldn’t have started worse as the night before a guided trip to Timsbury I awoke with a tickly throat. Fortunately the ‘man-flu’ hadn’t got hold of me come the morning as I found myself welcoming Rod to the banks of the river Test. Overnight the temperature had plummeted to -6 engulfing the countryside in a frosty carpet but with grayling are target I didn’t have anything to worry about. Rod wasn’t so sure, yet first trot down his confidence was lifted as the float buried and a lively sea trout headed skywards. Rods first encounter with the centrepin wasn’t made easy as all day long the rod eyes froze making trotting, let alone playing a fish difficult but he overcame the elements and enjoyed a fantastic day landing loads of fish including grayling, sea trout and brown trout to almost 5lb. To be honest I never really realised that I had a cold until back in the car and come the following day, well it was feet up, wrap up and suffer. Even now as I write this report the cough is still with me, but thankfully its slowly going, yet it does reflect on why the amount of sessions for January are some what down. Although I decided to be sensible for once, all was not lost as feature writing, especially for the European magazines took over and with the weather all over the place I knew that even if I had ventured out things would have been far from easy. I did however come up with a plan and this was to put in quite a few short sessions at a local lake for pike as well as pre-baiting a swim that had been productive in previous years. Sadly though catch images as they happened had to be held back in fear of other anglers reaping the rewards of my efforts, however I have now finished my short pike campaign on the water so hence the images shown. I did place a few on my face book page (Duncan Charman Angling) towards the end of the month and on my last session had an angler waiting to drop into the swim for the last two hours of the day along with another lingering suspiciously in the bushes close by. Good luck guys and to all that head there from now on. In total I visited the bank on thirteen occasions split between guiding (3), personal (9) and features (1) all of which added up to just sixty hours, yet if I were to add up the time spent pre-baiting then it would have been a lot more. As they say effort equals rewards and it’s not all about having a line in the water. This short pre-baiting exercise really opened my eyes to its effectiveness as on my last visit the first double was being released no more than nine minutes after casting out and the next double, the fifteen after a further ten! In fact I’m confident to say that the pre-bait concentrated every pike in the swim, and probably from a good fifty yards around to an area the size of a dinning table. They were literally lining up for the food, yet when repeats start happening, and knowing how pike don’t take to kindly to being caught, knew it was time to move on. I did have one short session with my brother on the Loddon at Stanford End for chub using lumps of flake on a very cold day. Things up there haven’t changed much as we had already earmarked three swims that use to hold chub, ones that probably still would, and they did. Predictable or what, yet one thing that has certainly changed is the size of the chub. Five years ago the average size was probably 5lb plus with a six pounder a regular visitor to the bank, yet now its probably 4lb with a five big for the stretch and a six, not impossible but a rarity! A trip to a local stretch of the river Wey on another cold day when the river was well out of sorts provided me with just three fish, a bullhead, a 1oz roach and a minnow and to cap it of in style both myself and Chris got our cars stuck in the car park. Damp grass on sand and on a slope doesn’t mix yet we did manage to get them out eventually by placing the car mats under the wheels. We did have to laugh at ourselves as Chris is a vehicle recovery man and at one stage I had blood pouring from a cut on my hands and being a First Aider should have had some plasters! Towards the end of the month I was fortunate to be asked to sit in the Bothy once again with Keith Arthur at Tight Lines as well as spending a day producing a video with the Online Fishing Team to go on BT Sports in a few weeks. Fortunately after cancelling the first date due to a frozen lake we arrived on probably the best day of the month. What was the fishing like and where did we go, well you will have to watch the programme (date will be shown on my face book page). I’m also writing this report up slightly earlier than normal as I’m fairly busy for the remainder of the month which includes a day’s pike fishing on a river tomorrow, a session that will be included next month. So what has February got in store for me? Well I already have six days booked up with guiding so this is good. Species that customers are interested in at the moment are the ones featured in January, pike, chub and grayling. These are great targets for those cold days with sport almost guaranteed, that’s if you choose your location and swim carefully, yet my own personal sessions will see me focusing more on roach and perch as well as maybe boring it out on the odd occasion for a big pike. What's in Anglers Mail this week? IT’S TOUGH out there but this week’s Angler’s Mail reveals a top trick to locate and catch fish in during cold conditions. The magazine’s Essential Knowledge feature reveals how to use dropshot magic to create a top leger rig. Need a holiday to look forward to? Angler’s Mail magazine’s picked brilliant fishing holiday venues around the UK – places to book soon! And lots more – only in Angler’s Mail magazine. Priced £1.90 (print issue), also available digitally for iPad, Kindle, Android etc in stores. 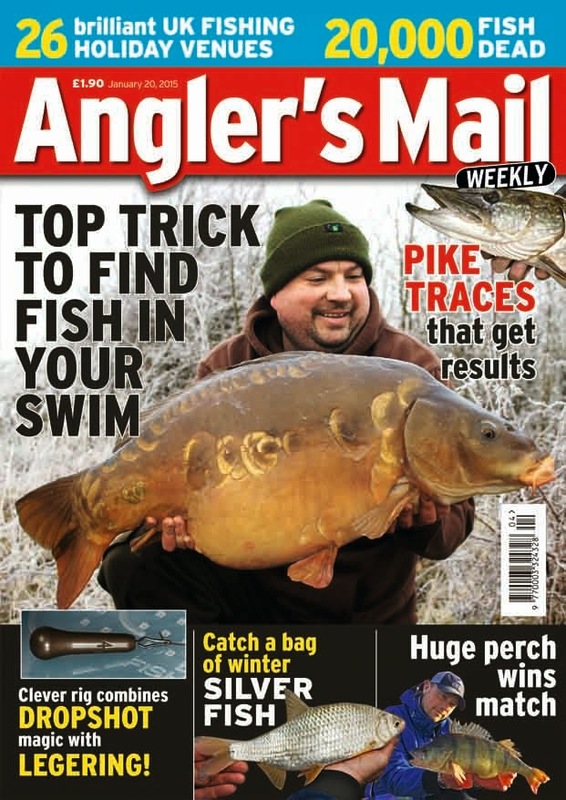 Visit www.anglersmail.co.uk for latest subscription offers and latest blogs. How to weigh a fish accurately. 1 – On capture of a big fish and after removing the hook make sure that it’s resting within the water safely and out of harms way. 2 – Dampen down your unhooking mat and sling but ensure that the sling isn’t running in water by wringing out any excess water. 3 – Place the damp sling onto the scales and zero in carefully using the adjustment dial. Double check that the zeroing is spot on by removing the sling and placing it back on the scales. 4 -Leave one of the eyelets of the sling on the scales hook and position alongside the mat but well away from any excess water. Ideally a smaller unhooking mat can be used or the kneeling pad of some larger mats but don’t place the sling on the mat where any water is. 5 – Lift the fish onto the mat ensuring that no additional water hits the sling. 6 – Slide or place the fish into the sling and lift. 7 – Hold the scales at the top preferable using a weighing rod. Never hold dial scales by their sides as this gives an incorrect reading. 8 – Record the fish’s weight. 9 – If the fish is something very special then I will place the fish safely back into the water, but on doing so avoid placing the sling in the water. 10 - Finally, with the fish resting once again within the water, take a second to place the sling back on the scales. If its bang on zero then all well and good, if its not, and this is a major problem with digitals as often they will read -2/+2oz, then something went wrong in your weighing procedure. Please note that the welfare of the fish is of up most importance throughout any procedure, be it playing, unhooking, weighing or photographing so attention to detail and being organised are both elements that need addressing closely. Always have a bucket of water next to you and never let a fish dry out. I always carry a Nash Fish-Care Kit with me and if the fish has any wounds then treat in accordance to the instructions. On returning a fish always ensure it cannot fall out of the item that its being transported in and even if it is secure keep it as close to the ground as possible and never turn your back or walk away from a fish when its on the mat. The do's and don’ts when weighing. 1 – Don’t hold dial scales by placing your hands either side, it gives a false reading. Always hold the scales at the top using a weigh rod or better still a tripod. 2 – Don’t weigh a fish in a sling running in water or dry, make sure it’s damp. 3 – Try to weigh a fish out of the wind as pressure from a modest breeze on a damp sling will add weight to it. 4 – Always zero the scales to the sling before adding the fish. This is where many anglers slip up. In their excitement on catching a big fish they simply zero the scales, and then place the fish within a sling which obviously weighs something. Example - If it’s a Gardner Sling Multi-Species sing then when damp it weighs 6oz. Add this to an 11oz dace and well you can see why often a 1lb 1oz dace looks somewhat suspect when claimed at a weight of 1lb 1oz! Carp sling weigh even more so once again a 29lb carp can easily be miss-weighed and recorded at 32lb plus! 5 – Never weigh a fish in a landing net, let alone a landing net with the handle attach. Yes some companies have manufactured landing nets with a ring so that fish can be weighed but it’s a bad practice and should not be encouraged. Some dial scales wont allow you to zero them to this, or in the case of digitals will reset when the net is removed giving a false reading when coming to weighing the fish. Weighing a fish like this is a bad practice and if used only used to give an angler a rough weight not an accurate weight. 6 – Weighing fish within a plastic bag, is it acceptable? Once again weighing a fish within a plastic bag is widely used but once again can give false readings as it’s impossible on most dial scales to zero the scales accurately as the plastic bag has very little weight. A damp sling is far more accurate, just like the 6oz Gardner Sling, as it has a weight when damp which can be zeroed in to the scales. 7 – If you are using Weighmaster dial scales then be very careful as zeroing these is a bit hit and miss, especially with a plastic bag. Example – A friend of mine uses these and I recall him catching a big rudd a few years back. I asked if we could do an experiment using each others scales, which he agreed. He weighed the rudd using Weighmaster dial scales within a plastic bag at 2lb 11oz; I used Ruben Dial scales and a damp sling and recorded a weight of 2lb 5oz! By weighing the fish again on his scales he continuously recorded different weights. 8 – Once your sling is damp and it’s been zeroed into the scales don’t place it on a wet unhooking mat. I usually hover this above the mat then carefully place the fish within, all the time making sure that the sling doesn’t get any wetter. Easy to do if there are two anglers, or the fish is something like a three pound perch but any bigger and it’s difficult when you are on your own. If it’s a big fish then just try not to get the sling wet after zeroing in. 9 – If you’re weighing a fish which involves having to make a some sort of mathematical adjustment, well your leaving yourself open to recording an incorrect weight. The reason we all taught simple arithmetic at schools is so we know how to add and subtract. I failed my maths exam, why, because its not my strongest point so will always avoid having to make a calculation to get a weight. 10 – Only use scales that have been designed for angling. I know of instances where anglers use scales that weight only in kilo or show 8oz as.5. Once again the angler then has to convent this into pound and ounces which once again can lead to inaccurate weights. If you are serious about recording your fish accurately then you need to buy yourself some proper scales. I gave up using Digital scales years ago, why because when electrics meet dampness they will eventually let you down. I used Fox Stalker Digital scales for years with no problems what so ever, even having them checked by weights and measures against two British Records and they were bang on both times. Eventually though these packed up. I should have paid the price and bought a new set yet by then loads of other companies such as Ruben, Chub and Korum had flooded the market with far cheaper versions. I tried most but all for one reason or another failed to inspire me that the reading given was accurate. So I now and have for many years relied on Ruben Dial scales, bulky and heavy yes but also accurate. I recall catching a rudd a few winters back which looked huge. Myself and angling companion Chris were both convinced it was close, if not a three pounder but my Ruben Dials recorded a weight of 2lb 6oz. Thinking that my scales were weighing light I asked Chris, who also uses Ruben Dial scales to weigh the fish on his and guess what, he recorded a weight of 2lb 6oz. It was just a massive framed fish that fooled both of us in the darkness and weighed far less than it looked. If you weigh fish in a plastic bag then surely you only have to ask yourself the question why did the British Record Fish Committee find discrepancies in accepting a potential British Record perch recently. I also recall seeing a big crucian last year reported to the press at a weight of 3lb 13oz 11drams. How did that angler get 11drams? For me as soon as I read such a weight, all I do is look at it, agree it’s a big fish but dismiss the weight as being accurate as in truth a fish can only be weighed accurately to within an ounce. If I also read about a fish that’s been weighed in a landing net I also look at this in the same way. Yes I have recorded fish within half-an-once, why because on weighing the needle is between two one ounce markers. To be honest most anglers including myself now forget about half-ounces and take the lower weight. The British Record Fish Committee now encourages this practice and showed this by lowering Martin Bowlers Crucian carp record from 4lb 9oz 9drams to 4lb 9oz. All in all, if you weight a fish incorrectly then you are only cheating yourself!